First of all, don't get me wrong about what you are going to read. Lake boating is a great way to enjoy outdoor recreation for those who like watersports and kicking back with friends. Many lakes offer convenient facilities that cater to boaters. I am writing to offer another alternative to boaters that is largely ignored. Many people cross river bridges with their boat in tow, heading for their favorite lake with no notion of exploring the waterway that they are passing over. 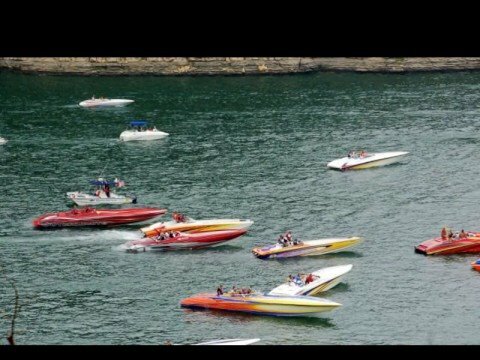 If the trip to the lake is on a weekend they will likely encounter a crowded lake with plenty of inconsiderate and often dangerous boaters. Tubing, skiing and rafting with other boaters is certainly fun and that is all many people are interested in but there are those of us who view boating a little different. We consider our boat to be a mode of transportation that can take us to wonderful destinations throughout the country, but we actually care more about the journey than the destination. With the exception of passing through the bigger cities, our rivers are the most natural of resources that we have access to. One can travel for many miles on most rivers and see the same things that river travelers did 200 years ago. Some rivers have lakes within their length, like the Tennessee River, but most boaters on these lakes go no farther than the dams that form the lake. Even when there is a lock, many people are apprehensive about locking through. Locking is actually quite easy and those boaters are missing out on some great river experiences beyond the dams. Those with large boats that are not easily trailered have fewer opportunities to explore rivers when they are on a confined lake but trailerable boats have few limitations and larger boats already on a river system can go great distances as well. Some people think that traveling on a river requires having a large cruiser but a small boat is just as suitable and in some ways are an advantage. There are always shorelines or islands to make camp and smaller craft can more easily access shallow coves and tributaries for anchoring or to tie off for the night. Fuel savings with smaller boats is another advantage. Why not put a boat in and actually go some place? While traveling on a river, one will never see the same shoreline and even when going back on the same river, it will seem different. The United States has 25,000 miles of navigable waterways to explore plus many other rivers that can be traveled in small craft. 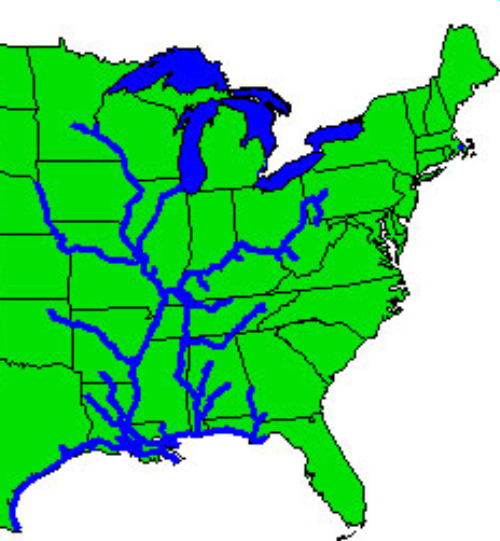 Many people don't realize that a boat could be put in at Pittsburgh and travel all the way to South Dakota or go from Minneapolis to Florida. Taking a trip on a river does not require a yacht or fancy cruiser. Those boats are nice and do have creature comforts to enjoy and for those fortunate enough to have one, I encourage you to use it for what it was built for...long journeys rather than dockside gatherings. For those of us who get most of our enjoyment from the river itself, those comforts are secondary. Long river trips can be taken in a canoe, raft, jonboat, pontoon boat, ski boat, or just about anything that safely floats and has a reliable source of power. That source could be strong arms and paddles. When I travel the rivers, I pay little attention to the big cruisers that pass by. What gets my attention and admiration are vessels like the one in the photo at right. Those folks are having a real river adventure and that boat is their pride and joy, with everything that they need to make them happy and enjoy the river. River boating is not for everyone. Rivers are different than lakes and piloting a boat on them requires due vigilance, responsible boating and good planning. Party boating is fine in a cove or a lake but there is no place for it while underway on a river. This writing will not go into all that one should know about safe river boating, but there are plenty of sources for that information, including this website. The reward for this knowledge is great. You will become a boatman (non gender) rather than a boater. For those of you who are seeking more than going in circles on a crowded lake I invite your to join those of us who have discovered the natural remote beauty and practically endless destinations that can be found on our rivers. While traveling on a river you will constantly be looking forward to what there is to see around the next bend. Be adventurous, explore and enjoy the rivers, be safe and leave no trace that you were there. Launching and retrieving a boat in the river may be different than at a lake ramp. The river current is the difference and should be considered. Most river boat ramps are built and an angle along the shore in the same direction as the river current. The reason for this is that you have more steering control while headed upstream, which is helpful when putting the boat back on the trailer. If there is not a great deal of downstream angle to the ramp, and there is adequate width, if is often helpful to back the empty trailer at a slight downriver angle to take avoid having the current push the stern of the boat sideways when trying to guide it onto the trailer. It is easy to see that long boat trips are possible on the rivers, but two or three day trips are great to. Even on a day trip, one can see a lot of river, depending on the cruising speed of the boat. I suggest that the first time you try river boating, do a day trip, then maybe a weekend trip. You will become more experienced and be longing for extended trips on the river. For those with fast boats, I suggest that you plan a reasonable cruising speed so that you can really enjoy the river and save fuel. Those who speed down a river at 50mph are not going to really get to know the river and enjoy the natural beauty. The best plan is to have someone drop you off and take the vehicle home, then pick you up when you return or when you reach a destination (not a round trip). State Parks are usually good places to leave a vehicle since they are patrolled and are not the kind of place that vandals and thieves often visit. Marinas with a ramp and parking are safe as they are usually busy with traffic and most of them will keep an eye on your vehicle (some will charge for parking and ramp use). Do not leave a vehicle and trailer overnight at a ramp in a remote location, away from highways, buildings or parks. You may come back to find them stolen or vandalized. If using a public ramp, pick one that is close to a busy road and park the vehicle close to the road to reduce the chance of it being targeted. If the location is far from home and you would feel more comfortable having someone watch your vehicle, it may be worth it to pay someone from the area to take it home and bring it to you when you return or reach your destination. I usually call the local fire department and ask them if they know anyone who would do this. I always get someone reliable through this contact. Put a locking device on your trailer hitch and the trailer spare tire. It is sad that these steps are necessary to insure that our property is safe from criminals but they are out there and they are not river people. Of course these precautions apply to those using lakes as well but more opportunities for overnight travel on rivers makes listing these suggestions more relevant.